Is Time Right for Toyota Prius in Thailand? New Model of Vigo to be Announced at 2005 Motor Expo Dec 2005? Submitted by peter on 2 February, 2008 - 20:54. Ah, yes. The first point has to be about the engines. I'm going to cut straight to it here: they are the old engines. 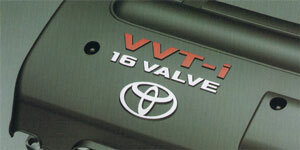 Yes, seemingly TMT find no reason to deliver the new Dual VVT-i engines employed in the Japanese and American markets. So, the new Altis has an ageing engine line-up, but apart from that, and the exterior door handles that seem to be taken straight off the Vios, the rest of it looks mostly new. The 1.6 litre 3ZZ-FE and the 1.8 litre 1ZZ-FE units have power output of 109 hp and 132 hp respectively, both achieving this peek at 6,000 RPM. Both units now support E20, although this is not reflected in the pricing the way I'd hoped. For example the base model 1.6 J MT is now THB 709,000 which is THB 4,000 more than the outgoing model at THB 705,000! Considering that Toyota are enjoying a 5% tax reduction from the E20 support, it seems strange that the price needs to go up! But things improve as you move up the range, and the price tops out at THB 969,000 for the range topping 1.8 G.
This morning I drove the Corolla Altis 1.8 G, which is the top-of-the-line Altis. I'm 184 cm so the first thing I noticed was the space, lots of it. The G spec includes a electric adjustable drivers seat, and after a few seconds fiddling around with the controls I was comfortably in a nice driving position. Looking around the interior there is not really a sense of quality, The plastics look much the same as the ones used in the Vigo truck! The fake wood trimmings at the base of the centre console and around the controls on the doors don't exactly add anything classy to the mix either. The impression is one of economy. When you start playing with things, the impression doesn't improve. The switches and controls feel on-par with those from the base model Vios, or the Vigo truck mentioned before, and although this isn't to say that they are particularly bad, it is just that some of the competition is very strong in this area. 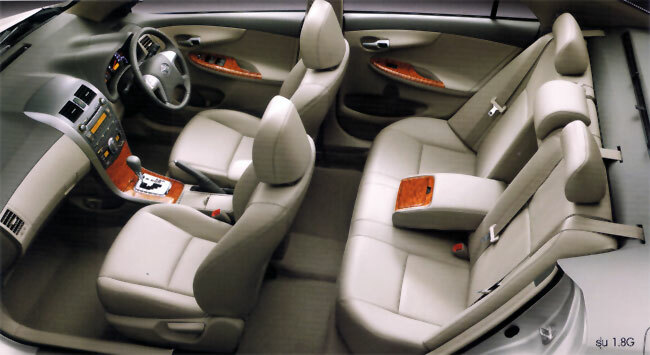 If you are into tactile quality then you might find the Honda Civic will give you more pleasure for your money. But, for the practically minded the new Altis shouldn't through up too many negative issues. There are some cup holders, and the controls are all well laid out. It doesn't take very long to get comfortable and the audio equipment is very simple to operate. And everything feels very well put together, despite the low-grade materials. 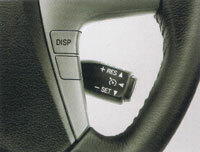 The steering wheel looks similar to the one from the Camry, with four spokes, and includes audio controls. Looking though it, the dials are very clear. Actually, I think they are just about spot on, with large self-illuminating digits surrounding conventionally sized radial speedometer and rev-counter. The illumination was always perfectly set for the lighting conditions. Again, there isn't anything particularly grand about the way this is implemented, but it is good. Two small LCD displays are inset, one in each dial. 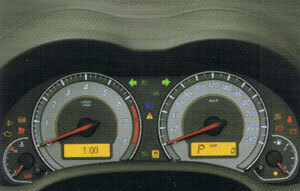 On the right is a standard odometer with trip counter function, while the one on the left shows you if a door hasn't been shut, and has a very nicely implemented real-time fuel consumption indicator. Both of these displays are backlit in amber, and are also very clear and easy to read. Functions are selected with a little stalk button next to each of the displays. The 1.8 G also includes cruise control which is operated via a stalk control which is attached to the steering wheel and rotates with the wheel. Unlike the high end Civic, the Altis doesn't include steering wheel paddle shift for the gear changes. 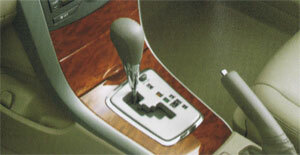 Manual shifting is available by nudging the gear leaver from drive to the right into sequential mode, with subsequent forward movements resulting in up-shifts, and backwards for down-shifts. This works very smoothly in operation, and I personally prefer this implementation. It is just strange that the Altis is still only using a 4-speed transmission, when the Civic has a 5-speed box. I found the seating comfortable, although rear seats suffer the same reduction in headroom experienced in the Vios. Sitting back my head was within a few millimetres of the roof. Although it didn't cause any discomfort while stationary, I can imagine that a bump in the road would result in my head hitting the ceiling. Okay, so this isn't as bad as the Vios, but I was expecting there to be at least as much headroom as in the outgoing Altis, which has plenty. Otherwise the Altis feels roomy and spacious. The floor in the back is virtually flat, so middle seat passengers will have less to complain about. And they will also benefit from a 3-point seat belt. The boot is also spacious, and thanks to the use of a Torsion Beam in the rear suspension, wheel arch intrusions into the boot are kept to a minimum. 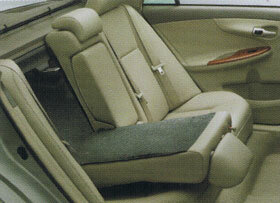 On the 1.8 litre models there is the inclusion of a 60:40 folding rear seat. This should really have been included across the range. I've been making quite a big deal about Toyota choosing to retain the old engines in the new Altis. Obviously I would have been much happier with the Dual VVT-i units, but just how bad are the VVT-i engines? Well, the 1.8 I drove was as sweat a unit as you could hope for. At idle the engine is all but silent. Power is ample for this car, and although I didn't clock the acceleration (such things don't really matter to me) I was happy with the throttle response. The automatic box shifts smoothly too. Previously I'd been driving a Chevrolet Optra, and there is simply no sense in comparing these cars. But I will anyway. To be perfectly and blatantly straight about it, the Toyota is so far ahead in terms of refinement it is simply not funny. In the Optra, pressing down on the accelerator in the hope of more speed would usually result in a lot of engine noise, and very little in the way of power. The Altis never felt underpowered, and even when I played with the sequential box and tried to make it break a sweat. The Civic might have more power in its 140 hp 1.8 litre, but I think you would be hard pressed to notice that extra 8 hp, and the refinement in the Altis is impressive. Taking my attention away from the engine for a while, I started to critically assess the ride quality. Again I'm impressed. The new Altis deals with bumps and potholes very well, and although there is the initial impression that the ride is soft, this doesn't result in any of the usual negative side effects. The car settles quickly after a bump, and deals with minor bumps very well. You feel them, but they don't bother you. Although I didn't spend an extended time in the car, I feel confident to say that it will make a very comfortable vehicle for long trips. The handling is also very nice. Toyota claim that it beats the Civic here, and even have little side by side charts showing the characteristics of each car. You'd probably need to be a race driver to notice the difference here, but I was very happy with the manners of the Altis when taking corners. The steering is Electric, which saves fuel and means that you can turn the wheels with a minimum of effort. It is popular for some motor journalists to complain about this technology, and they claim that it has taken away from the driving experience, removing the feeling of connection between the driver and the road. Em.... I like it. The Altis is easy to drive, and goes where you point it. It is very good. The new Altis has new brakes too, and now all four wheels have discs. And again, these feel good and according to Toyota, the Altis will stop sooner than the Civic. ABS, EBD and BA are included in all models except the base 1.6 J AT and 1.6 J MT models. The 1.8 G also includes VSC (Vehicle Stability Control) and Traction Control. And there is a large button to turn VSC off if you want to pretend you are Jeremy Clarkson! There are a total of 7 cars in the range, going from the base model 1.6 J MT, through to the 1.8 G. The safety conscious among us can ignore the 1.6 J and 1.6 E versions which lack Airbags. The 1.6 G, 1.8 E and I.8 G include dual airbags, and ABS, EBD and BA, which are also present in the 1.6 E.
Standard features across the range include 3-point seat belts for all passengers (finally), LED brake lights, Multi Information Display (MID), Electronic Power Steering, and disc brakes all round. Toyota has done it again. The Altis is a great car. Boring? Yes. But if you are like me, you've reached the stage in life where boring is sometimes a good thing. I think exciting cars are great, but I want to pay for and own a boring car. One that always starts when I turn the key, and always goes until I turn the key the other way. I want boring brakes that always do what I tell them, and I want so many safety features and stability systems so that I don't have to worry about having a skid even though I am driving too slow for that anyway. The Toyota Corolla Altis is boring, in all the ways that it is good to be boring. The styling is a little more daring than it needed to be, but still errs on the side of conservative. Then again, if you are looking for something exciting then you wouldn't have started reading this article in the first place. There are so many good reasons to recommend this car, and I could have written most of them before it was released. It is good value for money in the Thai market where very few cars offer that. The range topper is very well appointed to come in under THB 1 million. Running costs will be low, and fuel economy will be good. This is something you can take for granted, as do 99.9% of taxi drivers in Thailand. Before I test drove the Altis I took the new Honda Accord out for a drive. I just wrote a report on it too and...... I prefer the Altis. I don't want you to misunderstand what I mean here. I am not just saying that given the choice, all things considered, I would go for the Altis because it is better value. What I mean is that if you were going to give me one of the two, and I didn't have to pay for it, the Altis would be my choice. This 2008 Corolla Altis Review is, like all car reviews, simply personal opinion. Naturally you shouldn't base any purchasing decision on what you read on the internet! But... if you are in the market for a medium sized family car, don't avoid the Altis! Update : Toyota Motors Thailand haven't updated their website yet with details of the new Corolla Altis. So, I've taken the liberty of translating the specification sheet to English. 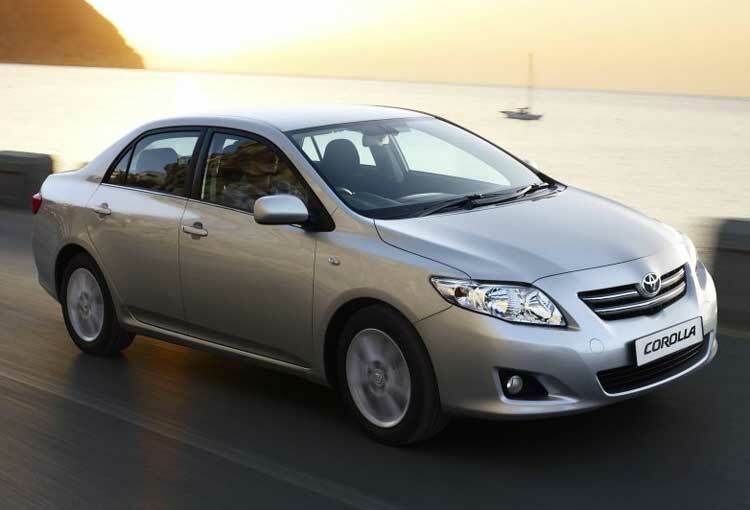 Click here to view the specifications for the Thailand Toyota Corolla Altis.